Note of February 23, 2015: Check the comments section for information a reader has provided on Catharine's parents and maternal grandfather Ezra Carpenter, as noted in the "Carpenter Memorial" by Amos B. Carpenter. 1830s autograph album that belonged to Catharine Rhodes of Foxborough, Massachusetts. 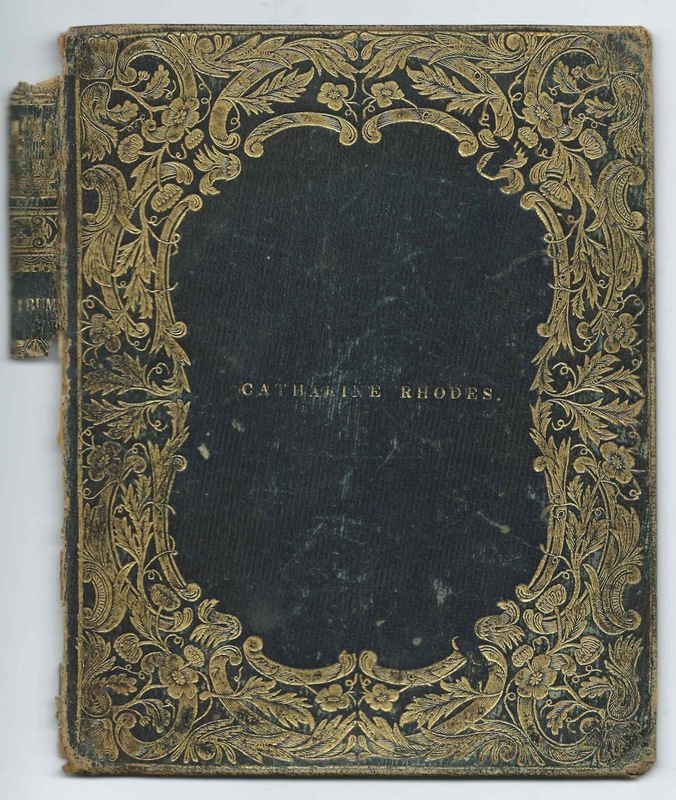 Some records show the family name as Rhoads, but, as you can see, from the front cover, Catharine, or whoever purchased the album for her, used the Rhodes spelling. 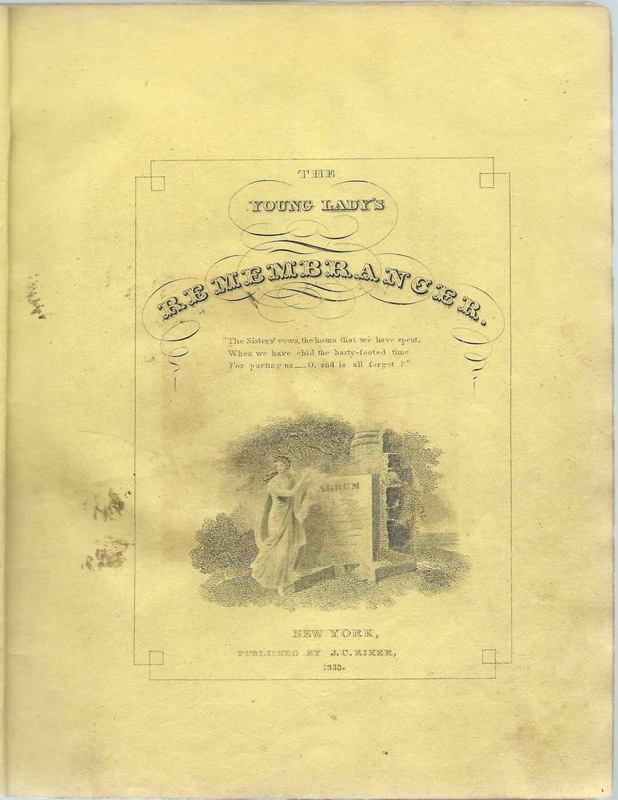 The album, published by J. C. Riker of New York in 1883, measures approximately 7-3/4" x 6" and is missing its back cover and possibly some pages at the end. It contains the sentiments of 45 of Catharine's relatives and friends, all from Massachusetts and Rhode Island, as far as I could tell. An alphabetical surname list and an alphabetical list of the signers, together with any personal information they offered, appear at the end of this post. 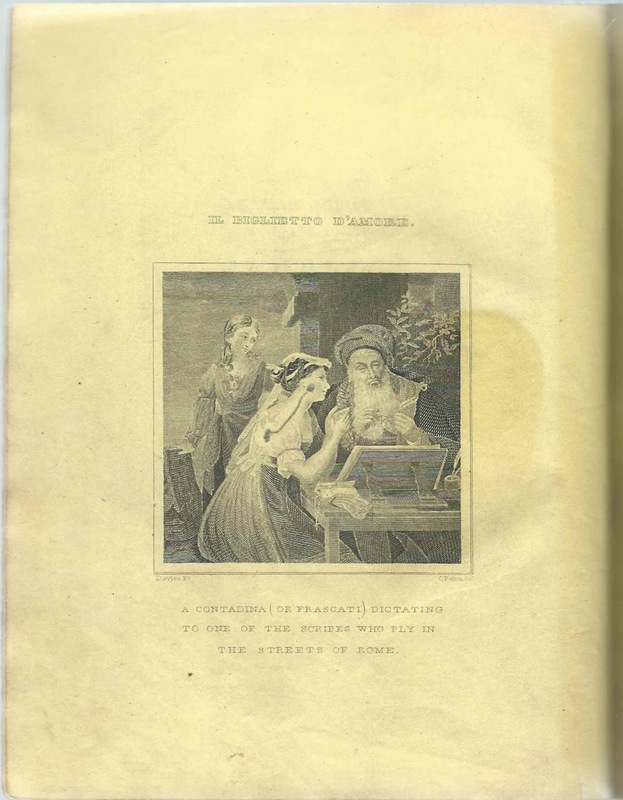 In addition to the title page, there are five illustrations throughout, only one of them the full-page frontispiece, shown below. Older half-sister Susan (Rhodes) Fairbanks, wife of Ira Fairbanks; their daughter Lucretia also inscribed a page. 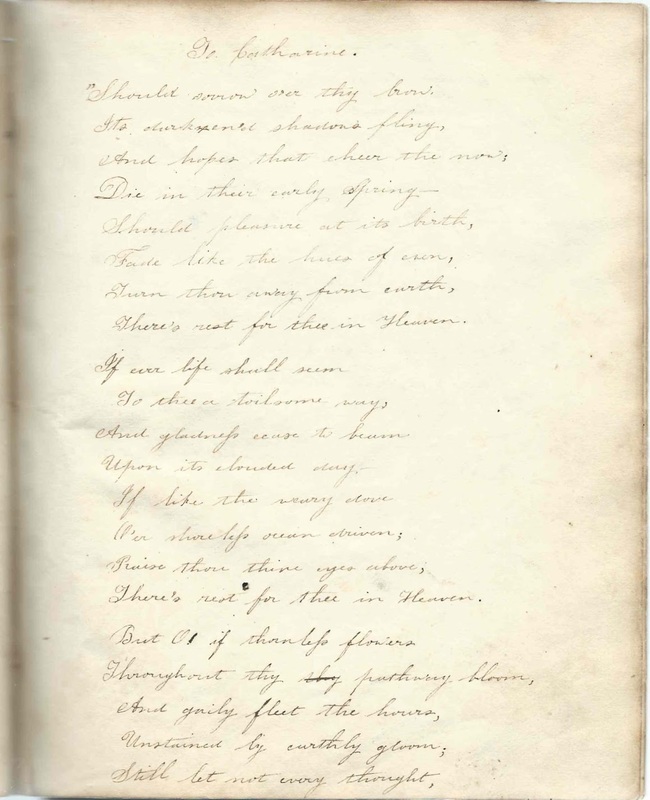 Younger full sister Martha (Rhodes) Hitchcock; her husband William Robinson Hitchcock also inscribed a page. Younger full sister Maria Rhodes. Annie Louse Payson, born July 31, 1855 at Foxborough, Massachusetts. At some point, Martha and Annie found their mother's album and added their names to it. William Phillips Payson died in 1895 and Catharine (Rhodes) Payson in 1906. If you have corrections and/or additions to the information above, or information on any of the signers listed below, please leave a comment or contact me directly. 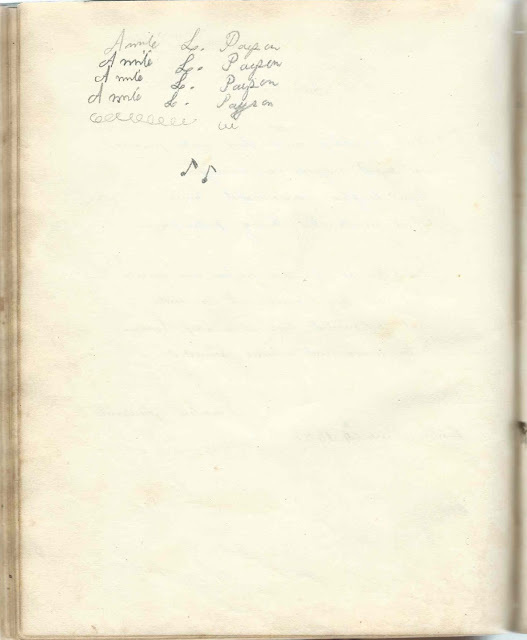 I'm including the images below in the hope that a reader can decipher the name of the inscribers based on the album's context. 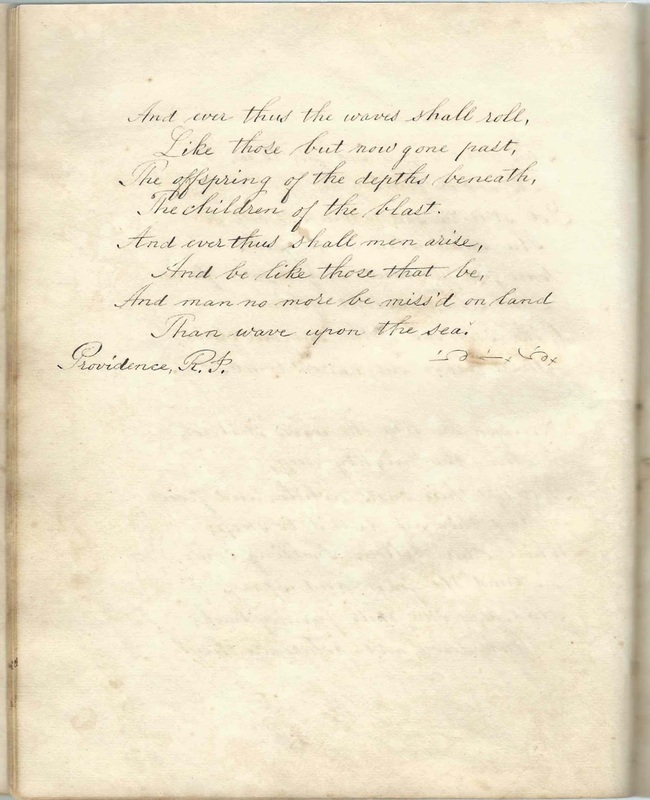 The four images consist of two 2-page sentiments, the first from someone at Providence, Rhode Island, and the second with no residence or place of inscription given. 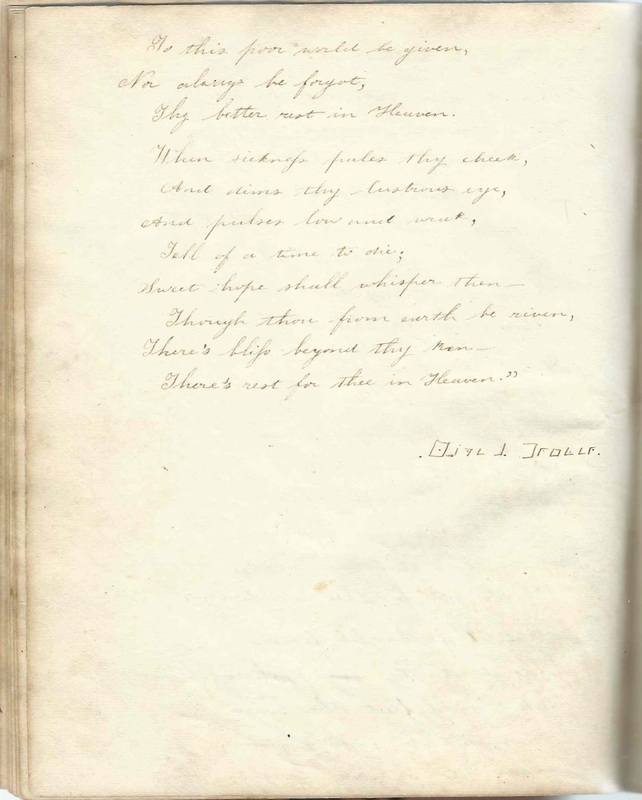 2-page sentiment by Greene, signed at Providence, Rhode Island. He might have been Alexius Greene, husband of Catherine's younger full sister Elizabeth Carpenter (Rhodes) Green. 2-page sentiment inscribed by ? Almaria Anderson of Ware, Massachusetts, signed at Foxborough, Massachusetts, on June 12, 1834. Not sure of middle initial. E. S. Barr, or E. S. Barrows, of New Braintree, signed at Foxborough, Massachusetts, in June 1834. Margaret A. Dunlap of Pelham, presumably Massachusetts, signed at Foxborough, Massachusetts on June 2, 1834. Susan, signed at Foxboro, Massachusetts, on February 1, 1841. Inscribed to "Sister"; so Susan was presumably Catherine's older half sister Susan (Rhodes) Fairbanks, wife of Ira Fairbanks. Lucretia Fairbanks, signed at Canton, on June 24, 1834. Daughter of Ira Fairbanks and wife Susan (Rhodes) Fairbanks, Catharine's older half-sister. William R. Hitchcock, signed at Foxboro, Massachusetts, in October 1838. Husband of Martha (Rhodes) Hitchcock, who signed the right facing page. Martha R. Hitchcock, signed at Foxborough, Massachusetts, in September 1838. Inscribed to "Sister Catharine". Martha (Rhodes) Hitchcock, Catharine's younger full sister. Martha's husband William R. Hitchcock signed the left facing page. 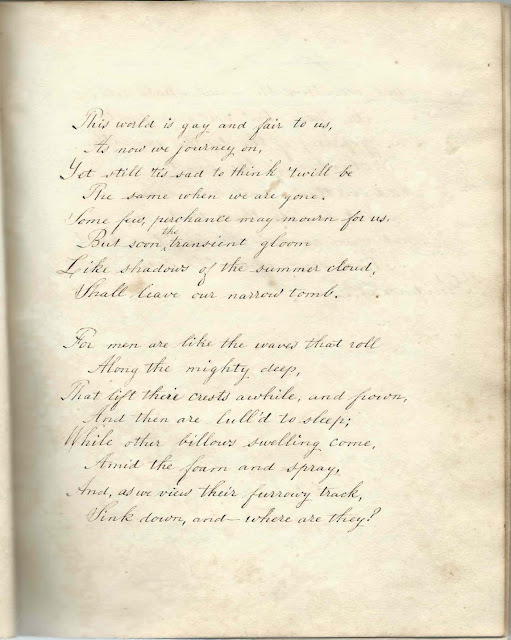 2-page sentiment by W. J. Pabodic, inscribed at Providence, Rhode Island, on December 16, 1833. Presumably poet William Jewett Pabodic. Annie L. Payson - she wrote her name numerous times. Annie Louise Payson, daughter of Catharine (Rhodes) Payson and husband William Phillips Payson. 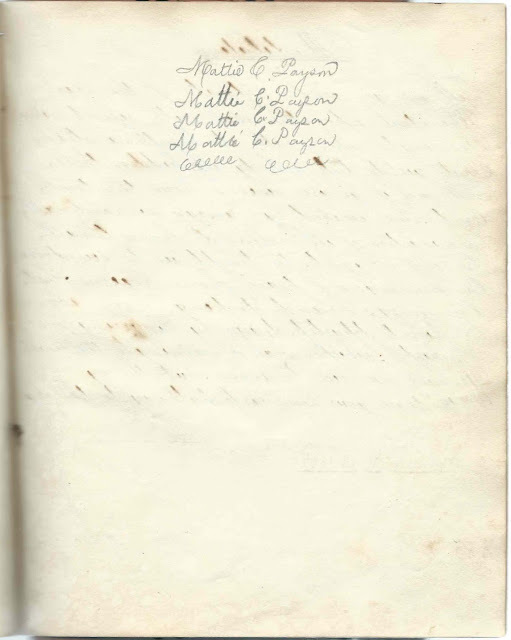 Mattie C. Payson - she wrote her name numerous times. Martha Carpenter Payson, daughter of Catharine (Rhodes) Payson and husband William Phillips Payson. Lucretia Rhodes, signed on March 22, 1838. Presumably the daughter of Catharine's older half-brother Stephen Rhodes and wife Betsy (Bird) Rhodes. Maria Rhodes, signed at Foxboro, Massachusetts, in 1834. Presumably Catharine's younger full sister. 2-page sentiment inscribed by Mary Williams. The date of May 20, 1834 appears in a different ink. Pam: From my personal copy of the "Carpenter Memorial" by Amos B. Carpenter (my mother's maiden name is Carpenter) . . .
Stephen Rhodes was a shoemaker in Taunton and his wife, daughter of Ezra C. and his first wife Margaret Daniels, was known as "Patty." She was born6/24/1787 and married S. Rhodes 3/20/1815. She was Rhodes's 2nd wife. Ann Daniels was Rhodes's 1st wife. They had five girls: Catherine, Maria, Martha, Elizabeth, and Sarah. Interestingly, Ezra fought in the Revolutionary War and was with Washington when he crossed the Delaware (according to the Carpenter Memorial). Many thanks, John! I'm amending the post to direct readers to your comment.